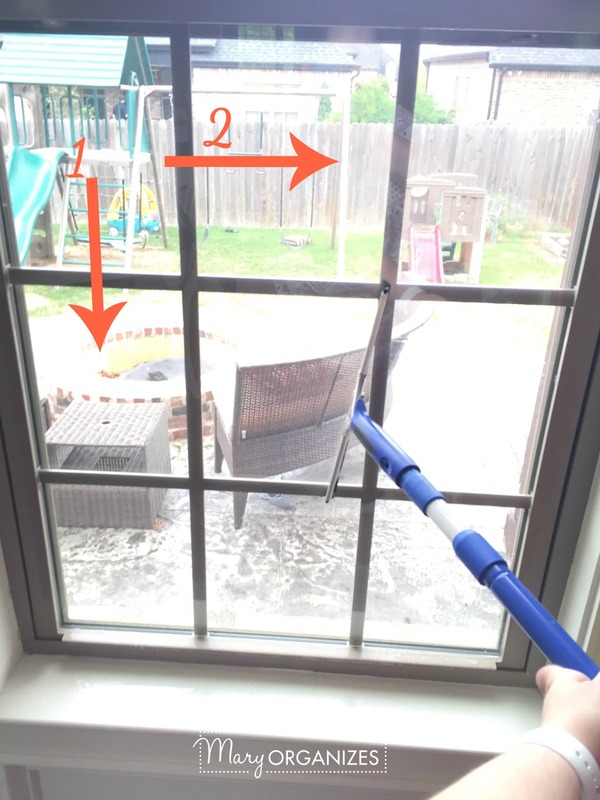 If you have a lot of windows on your home, cleaning them can be a big chore. 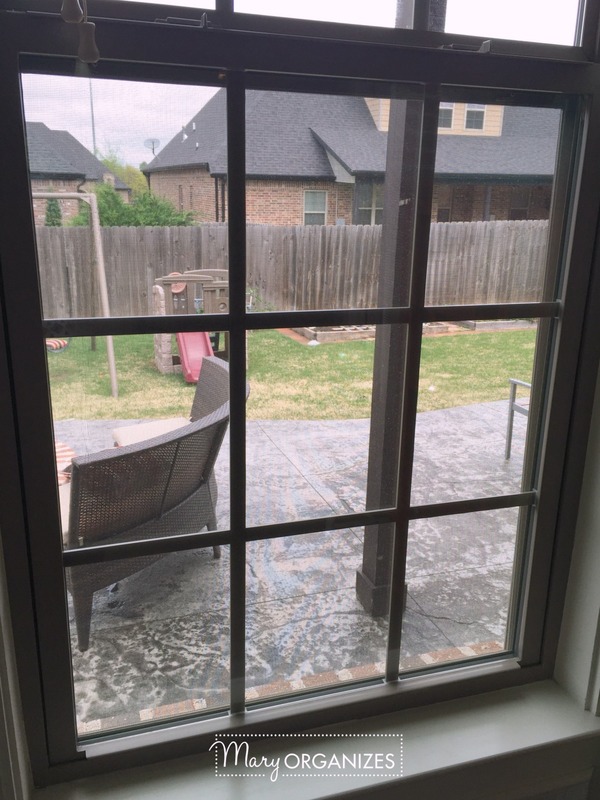 There is absolutely no shame in hiring a professional to come and clean your windows for you. There are many times that I hire someone to clean my windows when things get busy. I’m not a martyr – life is busy and sometimes you just need help! But, there are times when I’m ready to roll up my sleeves and do the job myself or take the time to teach my children the value of hard work. You don’t have to think of it as all or nothing. Do it when you can and hire out when it makes sense. Years ago, I asked a professional window cleaner teach me the tools of the trade. I’ll never forget how easy he made it seem! Step 1 – Mix Your Solution. You know You’ve got a good mix when there are a small amount of bubbles formed with any of the soaps you choose to use. This is about 1 teaspoon of Basic H and a casserole dish of water. I didn’t want to buy a special dish or bucket for window-washing, so I used something I had that would let me dip the microfiber covered blade into – a 9×13 glass dish works great. I think it is easiest to carry it all around in a laundry basket. Have I ever mentioned how much I love Laundry Baskets? They are my favorite container/ most versatile container in the whole house. The towel at the bottom of the basket is to cushion the glass dish and to absorb any drips. 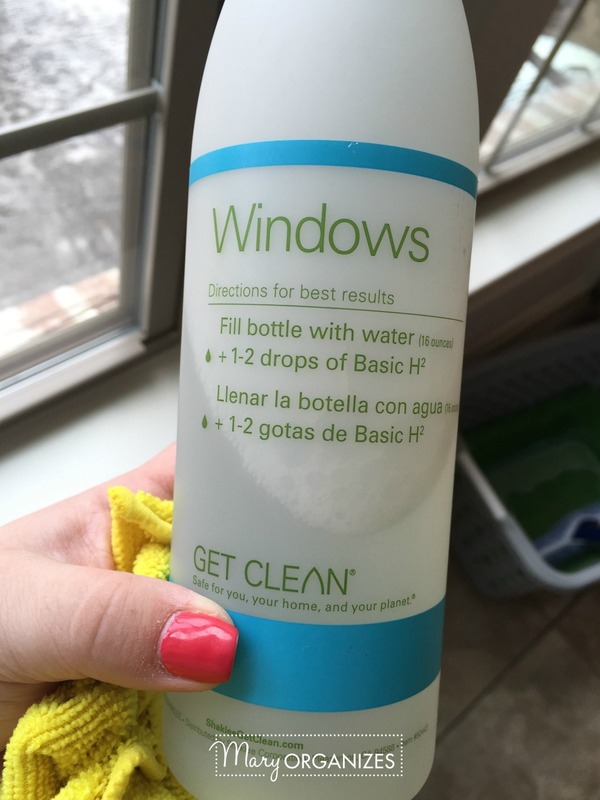 Dip the blade in the solution and then wash your windows. 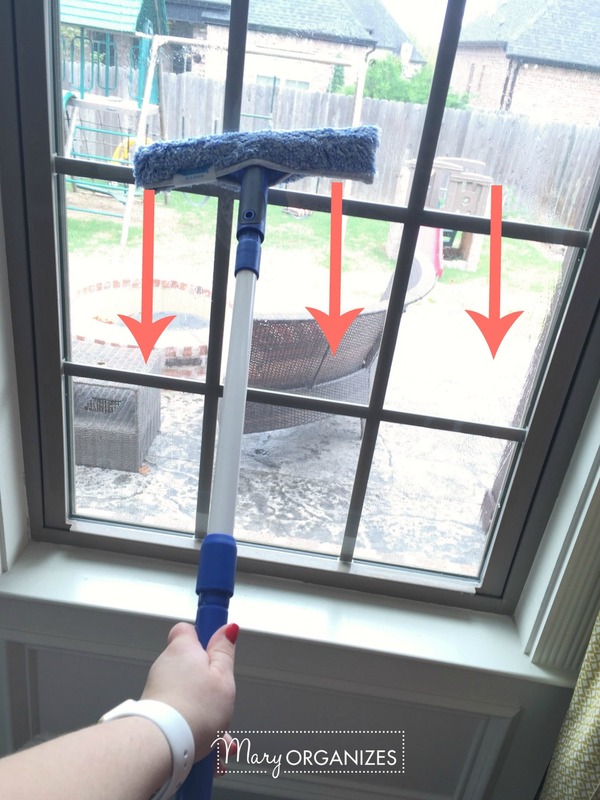 I found that downward strokes were the most efficient way to clean the whole window quickly, especially the tops of the windows. This part should go fast! Switch the tool tip of your extension pole to the squeegee blade. Start with the blade at the top of the window and pull down. Do this top to bottom motion moving left to right. Then Turn the Squeegee blade sideways, and pull it left to right. Do this left to right motion moving top to bottom. When you are done the window should be dry and very clean! 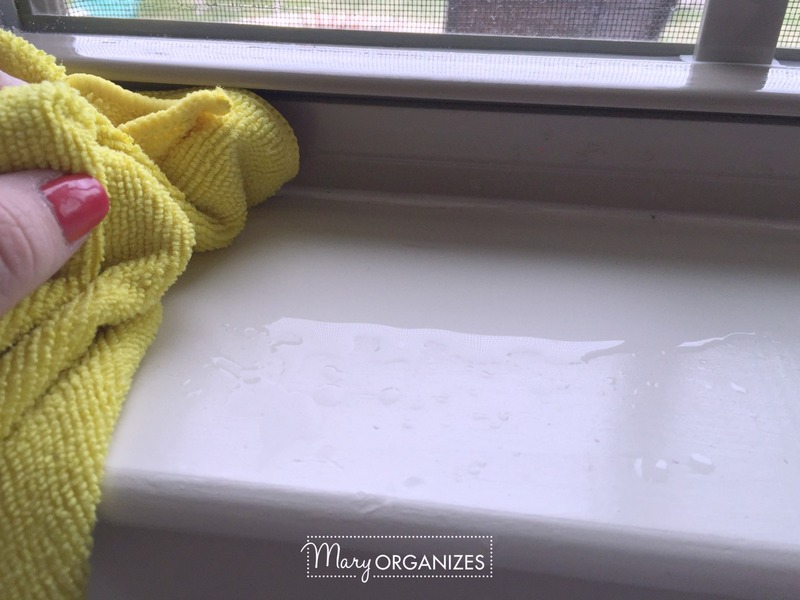 Before you are done with this side of the window, you need to clean up the moisture that will have gathered in the window sill. 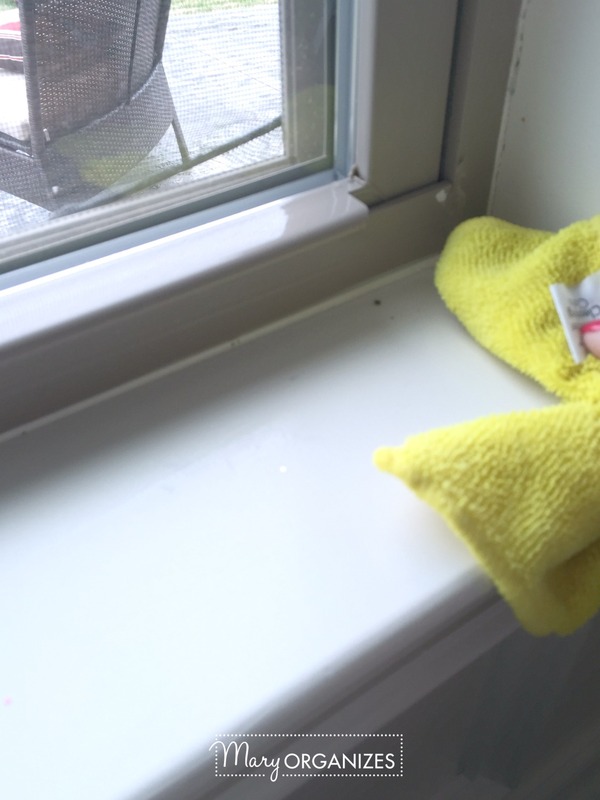 Not only is it important to wipe up this moisture, this is a great opportunity to clean the window sill itself! 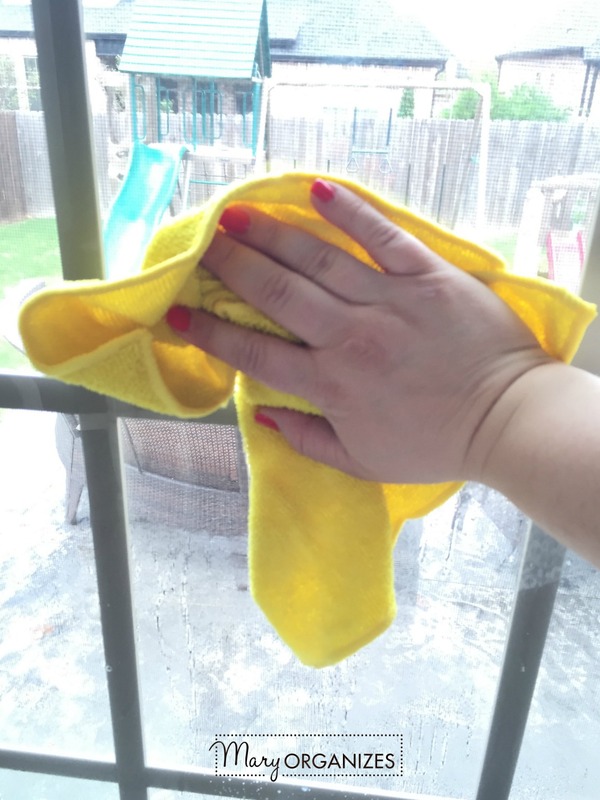 If you are cleaning lots of windows and your cloth becomes too wet, trade out for a dry cloth. Of course, the day I decided to take pictures for the blog it was raining outside. Isn’t that the way it goes? Ha! You’ll just have to use your imagination about what the window looks like from the other side. 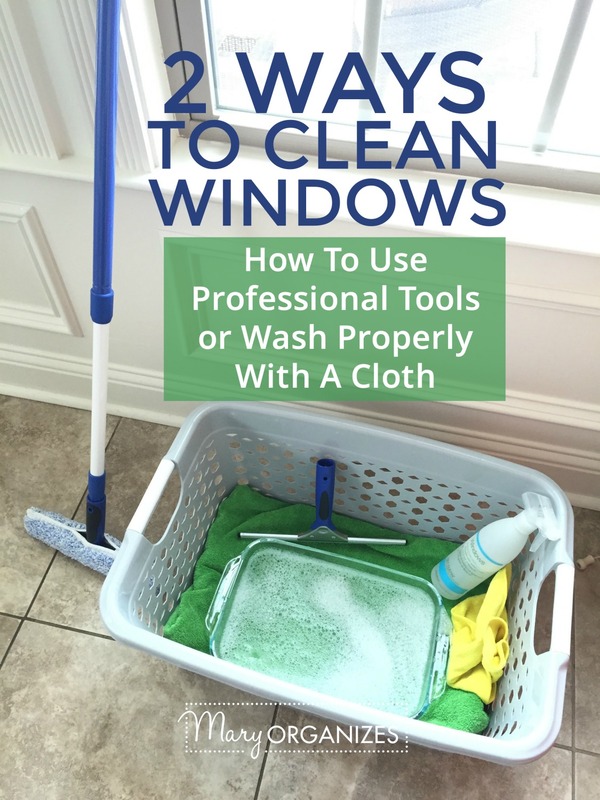 There are plenty of times you just need to wash the windows in your kitchen or your living room and not necessarily the entire house. For those times, it may be convenient to just use window solution and a cloth. There are tricks to doing that properly! Now, this picture may be deceiving because the window looks like it has more moisture on it because of the rainy day, but there are only a few sprays of the window cleaner on the window. When you spray too much cleaner on the window, it makes it too wet and then it looks streaky!! True story! So if the window is really dirty and you have to spray a lot to clean it, then you have to use a really dry cloth and dry it very well. When you wash with a cloth, wipe Top to Bottom on one side, then switch to Left to Right when you wash the other side. This really helps you see which side of the window the streak is happening or if there is still a spot on the window, it is easier to figure out where it is happening. 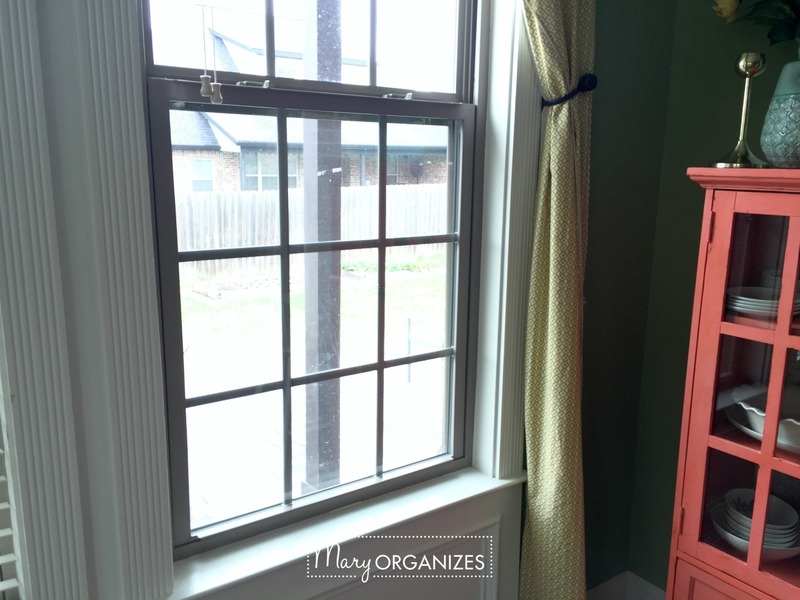 Always finish each side of the window by wiping down the window sill. This allows you to clean off any moisture that has gathered there, as well as give it a good cleaning. There you go – washing windows professionally or properly aren’t very hard. They can take some time to do, but you can definitely do it! 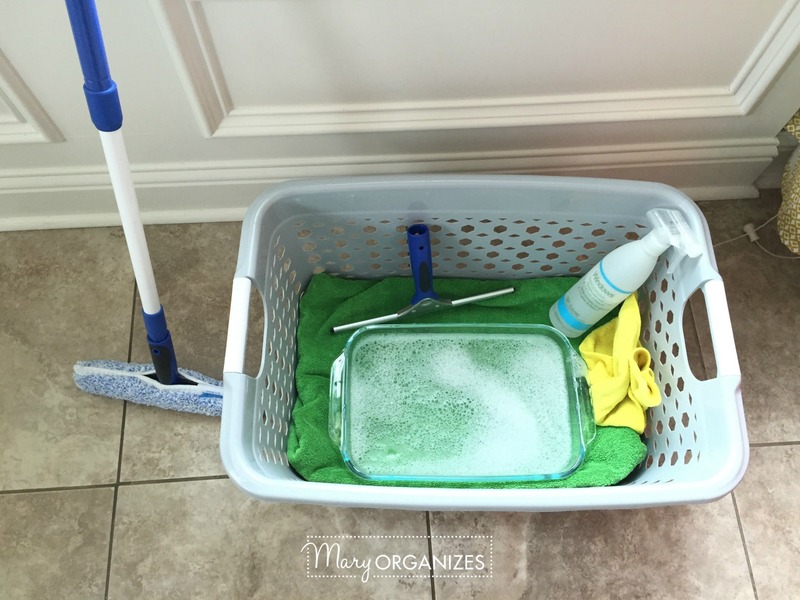 I hope you’re really enjoying seeing some of these surfaces shine as you’re going through your spring cleaning! 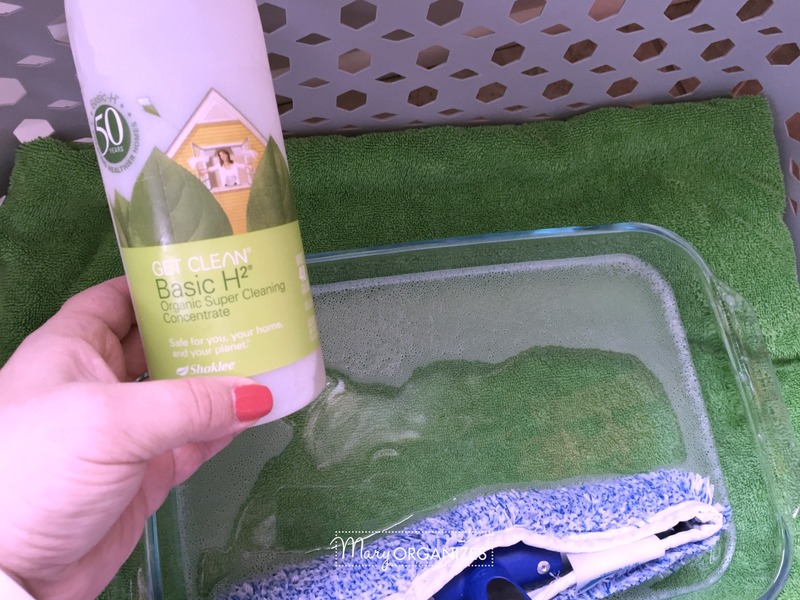 Shaklee’s Basic H is my personal favorite cleaner, which is why I use it in my cleaning tutorials. Obviously you are free to substitute your favorite cleaner. I am a Shaklee distributor now, but I chose to use these products before I sold them or even had this blog because I really do just prefer them. I like that they are natural, so I don’t worry when my kids use them, and they actually work. I do not have time to mess around with anything that doesn’t work. Starting with a Get Clean Kit is the best bang for your buck. My recommendation for you to get started would be the Get Clean Kit, Basic G, and Scour Off, because you’ll have everything you need to clean almost anything, from laundry to kitchens to bathrooms. This is great information and I have already been sharing it with friends! 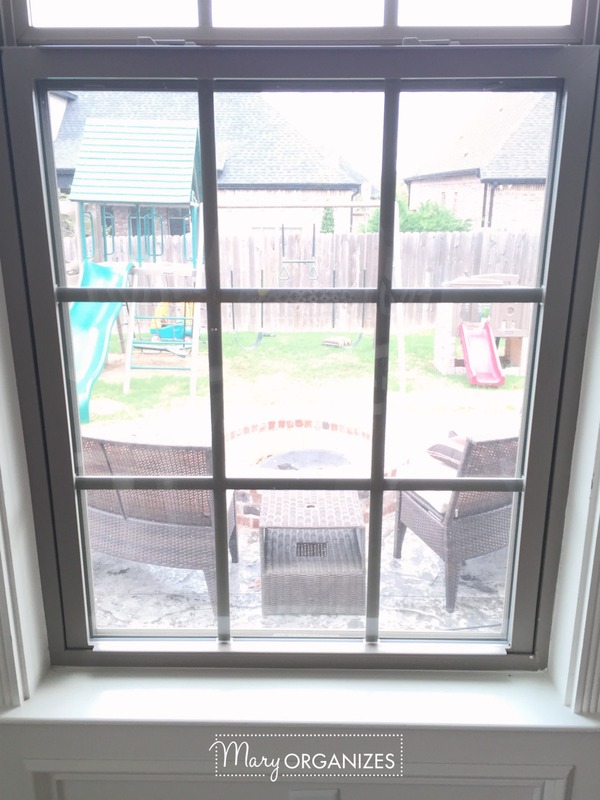 Another thing you might want to address, is to open the window and look in the sill for drain holes. Some may have them and some may not. If these drain holes become clogged, rainwater will just pool inside your window sill from the outside. I have been cleaning out those drain holes as well as I clean each window. I am loving your challenges. Thank you so much for doing them! And you’re welcome! I’m so glad you’re joining in!! Any tips or tricks to cleaning the yucky part between the screen and window? It’s so tough to get in all the crevices! This question gives me a little PTSD from white glove checks during my college-housing days. They made us clean these out every month and told us to do it with a cloth and a butter-knife. That works, and I’ve also used a toothbrush. If you clean it regularly, it doesn’t get too awful. I spray the cleaner right in there and then wipe it up. I like this tips ! 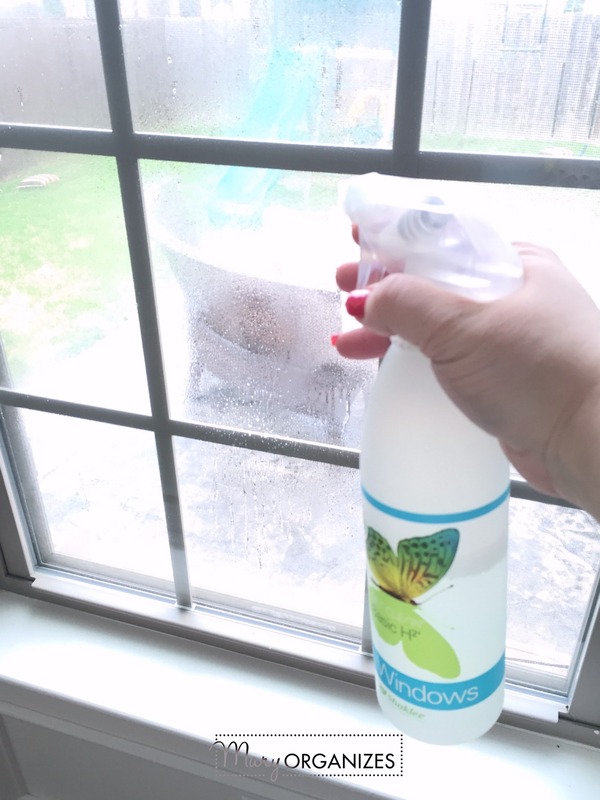 People think it’s so easy to clean the windows but it’s not like that if you have much windows at home you can see that there are still fingerprints or something else like raindrops…Thank you for sharing! I received the Shaklee products recently and love using them but I’m a little curious about something. Why not just use the Basic G on everything, instead of the Basic H and the Basic G? I was just thinking that most things you would want to disinfect as well as clean? Maybe I’m looking at it all wrong? You know, there are a lot of people that I know that do a lot of their cleaning with Basic G, probably for the reasons you just mentioned. I don’t think there is anything wrong with it. I personally just love Basic H and use it for almost everything. I do keep Basic G just as handy, though, because if anything has a weird smell (i.e. bacteria growing) or something like that, I jump straight to Basic G.
I have tried several times to buy the Shaklee products through your link. I also left a message 2x to contact me, but I’ve never gotten a response. Is it possible to buy some products to try them without the commitment of being a member or distributor? I’m so sorry, I didn’t receive those other messages. If you’re still interested, could you try to email me at mary [at] maryorganizes [.] com? You can definitely try the products without committment. 🙂 I hope you’re having a great day!